Brett Roberts and Erin K. Banks met with Anna Anisin, CEO and Jeremy Mason, Head of Marketing Operations of FormulatedBy, talking about the Data Science Salon conference. Although these conferences are focused on the data and sessions, they make sure there is time for networking, a great reception, and the best coffee in town. There are four Data Science Salon conferences in 2019. The verticals they focus on are media & entertainment and finance & technology and some of the themes at the conference are data governance, data modeling trends, impact of data quality, data strategy trends, data security, and data bias. Data Scientists are in high demand and with such awesome money being thrown their way, everyone claims to be one these days. So how do you know you’re hiring someone that actually has the data science skills needed on your team? Well that’s where this week’s guests from QuantHub save the day! Join your host, Cory Minton, as he talks with Matt Cowell, CEO, and Nathan Black, Cheif Data Scientist, in Birmingham about how the QuantHub platforms saves time in technical vetting of data science talent and helps make sure you hire the right talent every time! Recorded at the Data Science Salon in Austin, Cory Minton and Brett Roberts sit down Andy Terrel, President of the NumFOCUS Foundation, the non-profit team and community providing sustainable high-level programming languages, open code development, and reproducible scientific research with popular projects in like Jupyter and Pandas to name a few. Andy shares his passion for scientific computing, the power of open-source technology development, and how his team learned to be intentional about diversity by normalizing how we interact with each other. He shares how the diverse range of projects that NumFOCUS supports and how his team is making AI technologies more accessible. 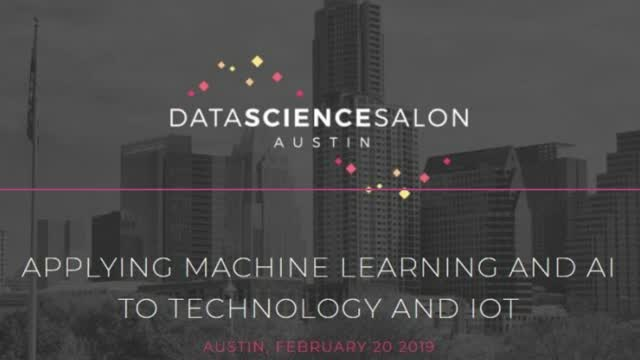 Recorded at the Data Science Salon in Austin, Cory Minton and Brett Roberts sit down with David Patschke, Director of AI Strategy for Dell Technologies Precision Workstations organization to hear about what Dell is doing to enable customers to be successful with AI. Reflecting on his previous experiences as a data scientist, David talks about the need for resource intensive machines to limit system constraints to give more time back to the data scientist. Cory, Brett and David explore some of the hardware trends that are impacting AI today and what advances are needed for the future growth of AI in the enterprise. Director of AI and BI at Arrow Electronics, David Fearne, sits down with the Big Data Beard for his second appearance on the show and muses about the rapid evolution from Big Data to AI in the enterprise and the challenges organizations are and will face making real impacts with these emerging technologies. This episode was recorded in the Dell EMC sponsor booth at Splunk conf2018 in Orlando, FL. A big thanks to Splunk, Dell EMC, and Arrow for making this possible. At Splunk .conf 2018, Splunk's product management teamed introduced Splunk Next and one of the major areas of innovation in the program was around IoT (Internet of Things). Seema Haji lead the keynote presentation and sat down with Cory Minton from the Big Data Beard to discuss what this announcement means for organization now and how it will shape Splunk's IoT strategy going forward. Doug Merritt, CEO of Splunk, sat down with the Big Data Beard to talk about the exciting announcements coming from conf2018 as well as how he is leading Splunk's massive growth while retaining their incredible culture and focus on using their powers for good. Join Cory and Rob as they discuss Splunk’s newest announcements with podcast alum Jon Rooney, Vice President Product Marketing for Splunk. In this episode we dig in on Splunk Next and its components. This announcement at Splunk .conf included the ability to use augmented reality, business process flows, natural language processing, Phantom, federated search, data stream processing, and quite possibly the most applauded announcement “Dark Mode". We dig in to the potential of each of these topics and their real world applications with Jon. We had a little fun with this one....it's all about real life impacts powered by Big Data. For this episode, the Big Data Beard team headed out to Squaw Alpine Resort in Lake Tahoe to talk with RJ and Tom about how their teams are using big data to make the skiing experience even more awesome. Sharing crumbs of Big Data goodness. Big Data Beard Inc. is a creative media company authoring podcasts, blogs, and videos aimed at sharing knowledge about the innovations happening in the world of Big Data, Analytics, Machine Learning, Data Science, Artificial Intelligence and Internet of Things. Join our BrightTALK channel to stay closer to the innovation in these emerging technologies and learn how to put them into action!